I’m going to post a word, and I want you to tell me what mental image you get when you read it. Ready? So what picture did you get in your mind? 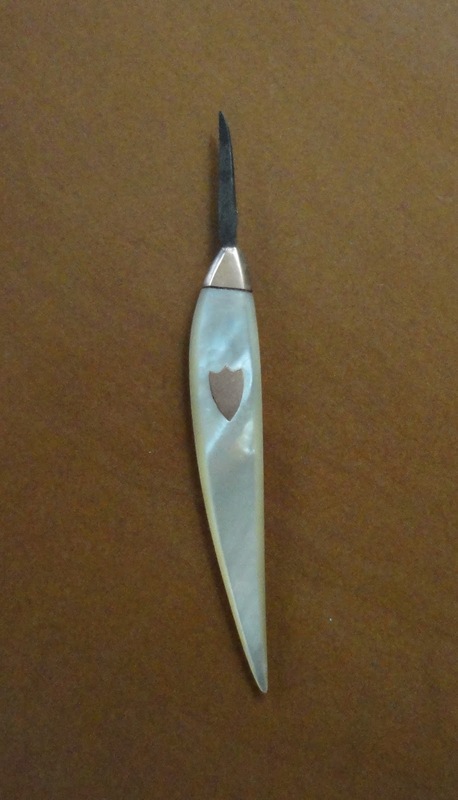 Maybe an object with short blades that fold up out of a protective cover? Or a Swiss Army knife with seventeen other bits and bobs on it beside a blade or two? Not much like today’s penknives, is it? That’s because it wasn’t. 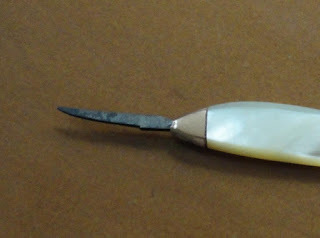 In the 19th century, a penknife was exactly that—a knife used to make or trim pens. Unlike what you might see in movies, a quill prepared for writing usually has most of the fluffy bits—the barbs—removed, so that they don’t chafe the writer’s hand. The shafts are heat-treated, which makes them stiffer (different methods can be used, from placing the quills in hot water or heated sand or ashes from the fire.) Then, one gets out one’s penknife and prepare the tip. There’s a great explanation of how to trim a quill here, for the truly curious...and it explains the fine, thin shape of a penknife’s blade since the blade was inserted into the quill at one point. Note on the photo of my penknife the shape of the handle—curved to fit comfortably against the fingers when shaving off bits of quill. So that’s what a penknife is. And though I’m very happy with my laptop for writing, I can’t help sighing a little for the pretty desk accoutrements of the nineteenth century. Maybe I could find someone to make me a pretty mother-of-pearl cover for my mouse?